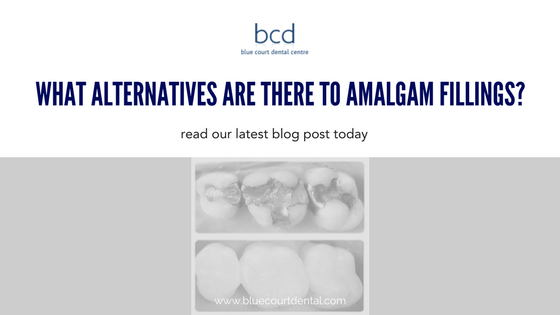 What alternatives are there to amalgam fillings? One of the things most dental practices want to do is to offer you alternatives to treatments, having a dental filling is no exception. There are a wide range of options when it comes to treating tooth decay with a dental filling and in this blog post, our Harrow dentist, Dr Nishan Dixit discusses what alternatives there are to the classic silver amalgam filling. There are a few alternatives to amalgam fillings, these typically include restorative materials such as glass ionomer white fillings, composite white fillings, porcelain white fillings and even gold fillings although these are not used very often nowadays. Amalgam fillings are still commonly used in the UK, particularly in NHS dental practices. The material is relatively cheap, easy to work with and durable. Amalgam silver fillings contain a mixture of silver, tin and copper which is bound together with mercury. Mercury poisoning is a concern of many people with amalgam fillings. The most risky time for release of free mercury is during placement and/or removal of an amalgam filling, this is due to release of mercury vapour. Having an amalgam filling removed can potentially release more mercury than leaving it in place. Several studies have shown that the amount of mercury released from fillings is extremely low, especially when left in place. However, due to their typically unsightly nature and potential to release mercury many patients are preferring to opt for a more cosmetic option. Another problem with amalgam fillings is that you can get what is known as an amalgam tattoo. This is where the dark silver colour from the amalgam shows through the front surface of the tooth creating a dark effect around the gum making it look like it has a tattoo. These are one of the most commonly used alternatives to mercury fillings. Composite fillings are mercury free and are often a blend of fine ceramic particles mixed with a composite material which sets when a special light is shone on it. The composite comes in a variety of tooth coloured shades so your dentist can select the right one for you. Composite fillings may wear faster than your natural teeth so you may need to have them replaced a little more often. White fillings typically last up to 10 years. Data shows that after five years approximately 75% of fillings remain. This has reduced to 50% after nine years. This is based upon research undertaken in 2001. Can you have White fillings on front teeth? Yes, white fillings on front teeth are often called dental bonding. They can either simply replace a small decayed area or cover the whole of the front of the tooth. They can also be used to add to teeth to make the teeth longer, if worn down, or to change the shape of a tooth. Are there any side effects from white fillings? Numbing of the area due to the anaesthetic used. Sensitivity of the tooth for a few days afterwards. This depends upon the type of filling you have had, amalgam takes approximately 24 hours to harden completely, during this time you should eat softer foods and avoid anything sticky. The white filling is set and made completely hard by curing the composite with a light in the dental surgery. This theoretically means that you can eat straightaway after a white filling. We do however recommend caution as you probably will have had an anaesthetic to numb the area whilst the filling was placed. It is better to wait until the anaesthetic subsides before eating as you should be careful of biting your cheek and tongue as these area are still numb. *Subjective data based on experience. Individual properties may vary depending upon the size, position and age of the restorations including the skill of the dentist that placed the original restoration. This entry was posted in Cosmetic, Dentistry, Share This Post and tagged Amalgam fillings, Composite fillings, Mercury, white fillings on 21 March 2018 by Dr Nishan Dixit.